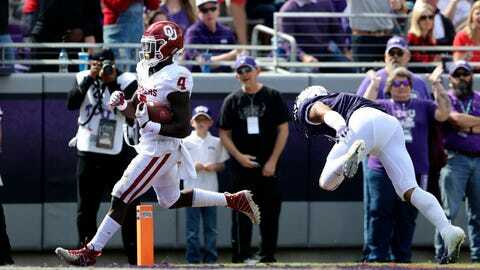 FORT WORTH, Texas (AP) — Kyler Murray threw four touchdowns, Kennedy Brooks and Trey Sermon both had 100-yard rushing games with scores and ninth-ranked Oklahoma rebounded from its only loss this season by beating TCU for the third time in 11 months, 52-27 on Saturday. The Sooners (6-1, 3-1 Big 12) won their 18th consecutive true road game, never trailing after scoring touchdowns on each of their first four drives. It was their first game since losing to Texas 48-45 two weeks ago, when they scored three touchdowns in a six-minute span of the fourth quarter to tie the game before the Longhorns kicked a field goal in the final seconds. “It was just perfect how the game unfolded, we came out and played like we were capable of, carrying over some momentum we had,” coach Lincoln Riley said. Brooks ran for 168 yards on 18 carries with an early 21-yard TD on a fourth-and-1 play. Sermon ran 17 times for 110 yards and scored twice before walking gingerly off the field after being tended to by trainers for a lower leg injury with about 8½ minutes left. This was a rematch of the Big 12 Conference championship game last December, when Oklahoma won three weeks after beating TCU in the regular season. The Sooners have scored at least 38 points in their last four meetings against Gary Patterson’s defense, which entered this game tops in the league allowing only 20 per game. Oklahoma played its first game since defensive coordinator Mike Stoops was fired, with Ruffin McNeill taking over that role. The Horned Frogs were held to 275 total yards and scored only two touchdowns offensively. “We played much closer to what we’re capable of,” Riley said. TCU (3-4, 1-3) trailed 28-7 midway through the second quarter when former Penn transfer Michael Collins replaced ineffective starter Shawn Robinson. The Horned Frogs had only 25 total yards before the quarterback switch, and their only score was KaVontae Turpin‘s 99-yard kickoff return . Collins threw touchdowns on consecutive passes just less than three minutes apart, with Turpin turning a short throw into a 41-yard touchdown and Jalen Reagor‘s 33-yard score after Oklahoma went three-and-out and punted from its own 9 after a sack and two penalties. Murray completed 19 of 24 passes for 213 yards, and two of his TDs were to Lee Morris (9 and 27 yards) on his only catches. The Frogs were within 31-27 midway through the third quarter when Cole Bunce kicked his second 41-yard field goal, but they didn’t score again. Oklahoma: The Sooners haven’t lost consecutive games in the regular season since 1999, and they still control their path to getting back in the Big 12 championship game — and maybe the College Football Playoff. TCU: There is now an interesting quarterback situation after Patterson for weeks brought up the idea of Collins playing more. Collins couldn’t maintain the momentum after halftime. He started 4-of-5 passing for 89 yards and the two quick touchdowns but was only 3 for 12 for 53 yards and an interception after the break. Robinson was 3 for 8 for 21 yards and gained nothing on his two carries.